In case you don’t figure it out yet, this is about car museums. I have general descriptions of each as well as hotel information whenever possible. Finally, please note the dates for each entry. I’m sure things have changed since I’ve visited many of these museums. Please check the contact information or their websites for more up-to-date information. Well, it’s not really my exchange rate, it’s more like the official exchange rates. A listing of Museums around Germany and their websites, if available. Once in a while, I accidently stumble into a normal museum, usually by accident. The Louvre just happened to be a bigger accident than usual. Cool place. 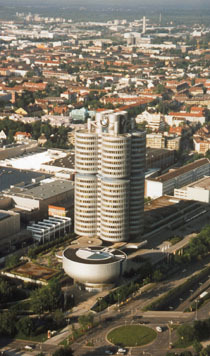 MUNICH, GERMANY (June 1998) -- The BMW Museum is the official museum of the factory. (In the picture on the left, it’s the “bowl.”) It displays some of the company’s unique and interesting products, from cars to motorcycles to airplane engines. They also have an extensive gift shop in the lobby. Where: [see map] The BMW Museum is located in Munich (München), near the Olympia Stadium in the northern part of the city. It’s on the Peutel Ring (a road). If you start heading for the Olympia Tower, you should drive right by it. Previously, I thought that you could park in the BMW parking deck just east of the Four Cylinder building (does this have an official name?) by just driving up to the gate and wait for the light to turn green. I did this in a BMW, and I think they just let me in. I’ve tried in other cars, and it doesn’t work. They tell you on the brochure to go park at the Olympia Parkdeck Fernsehturm (“space needle thing” is the official German translation, I think). MARANELLO, ITALY (May 1999) -- First off, let me say that I’m not a dyed-in-the-wool Ferrari tifosi, but after visiting here, I may bleed a little Ferrari red in addition to my Guards red. I only visited the museum. I’m not sure if factory tours are available. Oh, and there’s a gift shop. Where: Ferrari is located in the small city of Maranello, just south of Modena. The factory, the museum and a test track are located very near to one another. Other: Try to go there on a weekday if you can. Other than the fact that it’s less crowded, there is also the possibility of being there while they’re testing their Formula 1 car at the test track. When they do, you can hear the engine from anywhere in town. The sound is absolutely beautiful. I didn’t get to see the car actually running (because I was too pokey), but I didn’t have to. The music was enough for me. However, I did find out where you can see the test track for all of you budding spy photographers out there. There is a bridge just north of the city where you can see a portion of the track, as well as a couple of factories nearby. Go see the map for the locations with respect to the factory or museum. STUTTGART, GERMANY (September 22, 1999) -- Well, I finally made it to this museum. It was a pain finding my way through Stuttgart by myself, but at least I made it. And yeah, I know the company is now supposed to be called DaimlerChrysler, but I prefer Mercedes. When they change Mercedesstrasse to DaimlerChryslerstrasse, then I’ll start calling it the DaimlerChrysler museum. The museum is located inside of the DaimlerChrysler facility. You have to take a bus into the complex. This bus picks up at a couple of areas. They are marked by signs for the Museum, although these signs weren’t completely obvious to me (but then, I was driving alone). I found this museum to be pretty good, especially when compared to the other German auto manufacturers museums. While it’s not as large as the BMW museum, they still have a lot of cars and some very interesting displays. For example, they have the first car and motorcycle that were invented. I even got a treat -- someone was showing a group of American business people the first car invented (Benz), and then proceeded to start it up. It was like staring at history in a time capsule as the engine chugged to life before locomoting the car a foot or so (it was on a display stand). I would recommend this museum to the automotive history buffs out there. I didn’t see any GT1 cars, but there were pictures on the wall commemorating their 1998 win at Le Mans. One display I found very interesting was a wall of 1/43 model cars showing various Porsche car lines. It was almost like a family tree, with each model line showing its various iterations through time. Compared to the BMW Museum (see above), this is pathetic. However, a Porsche devotee will still want to come here, even if only for psychological reasons. But hey, it’s free! What do you expect? They also have a small gift shop in the museum. LE MANS, FRANCE (April 14, 1999) -- The Le Mans museum is located right by the race track grandstand in Le Mans, France. The city of Le Mans is about 200 km west and a little south of Paris. You can take autoroute 11 (A11) through to Le Mans, but I recommend trying out the back roads / highways if you have the time. The museum contains a large array of cars (though not like Sinsheim below), mostly dedicated to the race itself. And of course there is a souvenir shop on the premise. Other: A word about the Le Mans race track -- it’s not a fixed course. When not being used as a race-car torture test, it is being used by peace-loving French drivers from around the different towns of the region. This means, for example, that you can’t do 200 mph down the Mulsanne straight, as there are traffic circles strategically located on the road (and throughout France, gosh darn it). But -- and it’s a big but -- it’s still possible to drive on most of the circuit where Porsche, Ferrari, Ford, Maserati, (and more recently) BMW, Mercedes (okay -- DaimlerChrysler), and Audi battled for 24 hours. I’ll post the route at a future update. Umm... I forgot to check on opening times and costs, so call them if you really want to know. If you go there outside of June (when the race is held), it’s a good bet it will be pretty empty. There’s probably more old Corvettes here than at a British naval museum’s “By Jove -- We Used To Have Power and Influence” Exhibit. It still can’t touch the Sultan of Burnei’s stash of cars, but since I haven’t been invited to the Sultan’s garage, this will have to do for me.